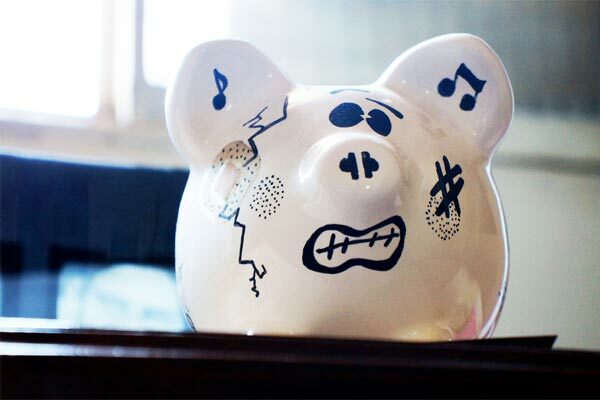 At some point, like so many families, you and your parents may find yourselves trying to figure out how to make tuition ends meet without remortgaging your house, decimating retirement accounts, or selling a kidney. So what happens when you’re knee deep in sophomore, junior, or senior year of college, and for some reason or another, you and your family can’t afford your tuition payments? Your first step should be talking to your school's financial aid office. (If you're fresh out of high school and haven't started college yet, you might be able to appeal your financial aid award. More about that here.) Share your situation and see what they recommend and what you have available to you—but don't go in expecting a miracle. Otherwise, your college's financial aid office will help you as best they can. For example, they may be able to put you on a new tuition payment plan, which could ease the burden of paying a lump sum, though it won't reduce the amount you owe. They might also suggest additional sources of aid to explore now or in the future, like unique scholarships, grants, or campus jobs offered by your school. Finally, they can help point you toward reasonable student loan options, which may or may not be your only option when you're up against the wire. 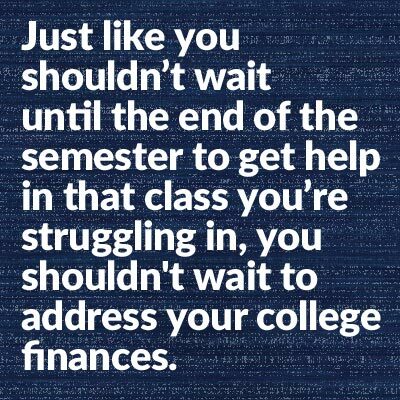 But just like you shouldn’t wait until the end of the semester to get help in that class you’re struggling in, you shouldn't wait to address your college financial worries. You should start talking to people (financial aid and academic advisors, family members, etc.) at the first sign of money trouble. First things first: take a look at all of your expenses so you have a full, clear picture of your finances (tuition, living expenses, earnings, any scholarships/grants/loans you already have, etc.). You need to know exactly what you're up against. You will probably need to get some cold, hard numbers from your parents too. If you haven't yet, file the FAFSA as soon as you can. You'll find FAFSA deadlines straight from the government here. Remember: financial aid is first come, first served. If you haven't filed before, here's our comprehensive FAFSA guide, and again, your school’s financial aid office should be helpful if you have questions. What about earning and saving money? Could you live at home and/or give up your meal plan to save money on room and board costs? Are there work-study opportunities on campus you are eligible for? What about local part-time jobs? You might even be able to work and attend class part time, really scrimping and saving so you can pay your way. Here's a list of ways students can earn money without getting a job. Can you go to school part-time? Or can you bulk up on courses and/or take summer classes to fulfill your requirements? Those may be cheaper options. You may also be able to get credits (and save on tuition) for internships or other extracurricular activities you do. Your academic advisor should be able to help you answer these questions as well. Then there's scholarships. Even if it's late in the semester, you may still find some, and it's always a good idea to look, even if it's for future opportunities. Use scholarship search tools, search Google for "scholarships + [something relevant to you, like a hobby, your family's heritage, your major, etc. ]," and ask people you know if they have any unique scholarship connections. For example, your mom's company might have its own scholarship program for employees and their families. Last but definitely not least, college-sponsored scholarships actually sometimes get overlooked. Have you exhausted all scholarship opportunities at your school? Your financial aid rep might be able to point you toward those institutional awards. The point is, even if you've already searched and applied for scholarships at school and elsewhere, you never know what else you may find. If you’re considering taking out a student loan, doing all of the things listed above and more might help you reduce the amount you owe now or in the future. And the less you need to borrow, the better. If you decide to borrow money for college, first try going to a credit union, as they often have better rates than other private lenders. Also, be sure you can shoulder the financial burden after graduation; you need to have a good idea of what you'll owe every month along with your possible starting salary. You really don't want to be spending more than 15% of your post-tax income on student loan payments. Get started by looking at these online calculators for loan repayment schedules and salary ballparks. Okay, so you've left no financial aid stone unturned and you still can't make your tuition payment. That's tough. But it's not the end of your college journey—no way. If it does come down to taking some time off from college so you can earn money and find scholarships, I highly recommend making a detailed plan of attack before doing so. Taking time off from college is notoriously risky—a lot of students simply never make it back, and with no degree to show for it. But you can set yourself up for success if you lay out a detailed plan of attack for your time off: I have X credits remaining, I will take one year off, I can save $X/month, I will be on a $X/month tuition payment plan, I will spent an hour each night researching and applying to scholarships throughout my time off, etc. (But even more detailed than that!) In any case, be sure to plan with your academic and/or admission counselors as you prepare for your time off and eventual return to school. Ask for help, be honest, be tenacious.